One of the most clever design solutions for small spaces is the versatile and moveable kitchen island. Taking up no more space than a few feet, a slender kitchen island adds a work surface and storage without permanent cabinet installation. This kitchen island with wheels adds a much-needed surface area, drawers and open shelving to your kitchen. In a kitchen that’s not large enough to house an island of deep proportions, the moveable slender kitchen island is the perfect prep surface, providing a place to slice, dice, set and serve. 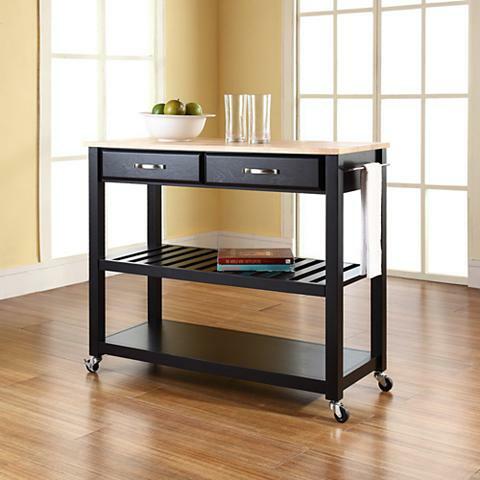 A portable kitchen island can do double duty as a dining buffet or beverage cart. Tucked up against a wall, the slender piece of furniture is a handy spot to lay out appetizers and drinks or store cookbooks. Expand the storage of any pantry by tucking a small scale moveable island inside, one that can be brought out when hosting parties or for holiday baking sessions. While intended for use in a kitchen, moveable islands and carts are in no way limited to that space. There’s no rule that says kitchen islands have to be used solely for food purposes. Reinvent it as a home office and make one the perfect place to sit down on a stool with a laptop to catch up on emails or surf around online. Lamps Plus has a variety of movable islands and carts in varied styles and finishes. Don’t miss the Shop By Room galleries at Lamps Plus with even more inspiring kitchen ideas including lighting, layout, and finish inspiration from traditional to contemporary.